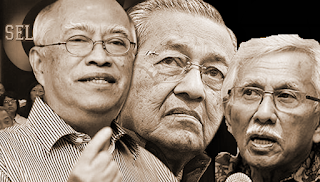 Why didn't Mahathir file lawsuit jointly with Sanusi or Daim? Over breakfast, a friend wondered as to why Tun Dr Mahathir did a joint lawsuit together with his paid minions, Dato Seri Khairuddin Abu Hassan and Anina Saadudin. There seemed to be many supporters judging by the names in the G25. Any of them could jointly file the lawsuit and give more credibility. Why not them instead of the two clowns? Why not have credible faces like Tan Sri Sanusi Junid and Tun Daim to jointly do the application related to Tort Misfeasans? Sanusi and Daim were signatories to the Citizens' Declaration, though Daim's absense and silence remain a mystery. And, there is also the supposedly long list of so-called credible personalities in the coalition of NGOs and opposition leaders in the Citizens' Declaration. 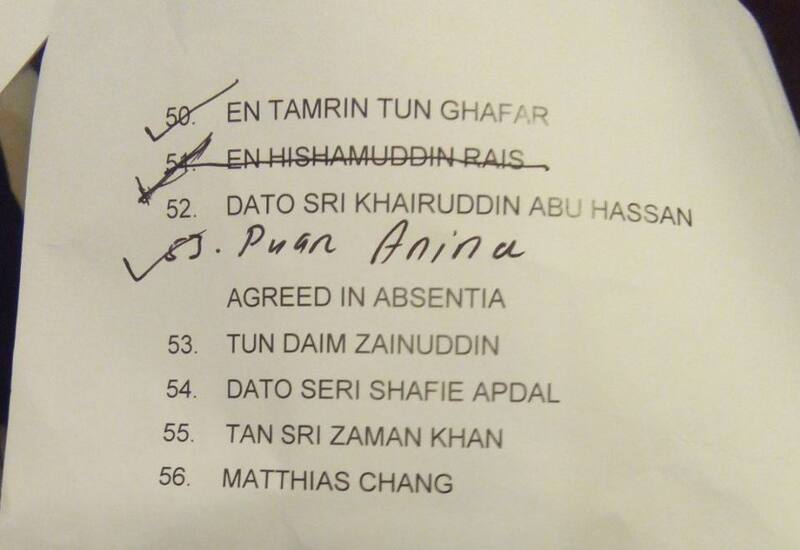 Forget certain names that claimed to be in the list but they are not in the like Tan Sri Zaman Khan and Tengku Razaleigh Hamzah. Any of them could have be jointly filing it. Why the two dogs with only big bow wow but upstairs zero? It is a deja vu similar to the July 23rd 2015 event at Tan Sri Gani Patail's home. Our source claimed Tan Sri Abu Kassim convinced Gani to pursue Najib "since he is retiring, charging will be one way to get public to remember him by. 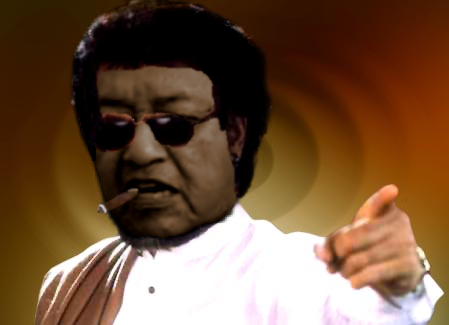 It clears his name from past misdeeds." The timing of Zeti's statement is uncanny and seem to compliment Bar Council's motion to demand AG's resignation, Bar Council's filing of judicial review, Tun Dr Mahathir's lawsuit against Najib, and Dato Zaid Ibrahim's "Citizens' Declaration" March 27th gathering. With many media and news portal playing up Lim Guan Eng's house purchase issue, it like extending assistance to relief the Penang CM of the pressure. 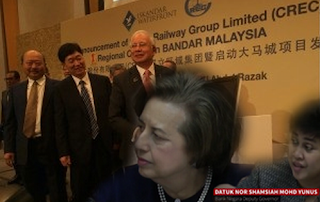 This surprise is a party pooper to 1MDB confidence boasting move by CREC for Bandar Malaysia. Bar Council had just done their Wayang Tamil bit and now Tun Mahathir is doing his. 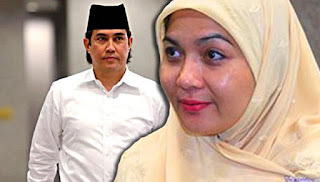 Today, Tun M filed a lawsuit on a claim of abuse of office against Dato Najib with two of his paid Geng Loceng actors, Dato Seri Khairuddin and Anina. He raised issue over the sacking of Tan Sri Muhyiddin, Tan Sri Gani Patail, etc. Frankly, this will not pass the exchange of affidavit stage. Minister for Communication and Multimedia, Dato Salleh Tun Said Keruak said it is indicative of Tun M's desperation to take the legal avenue after he has exhausted his "political avenue". Hopefully he remembers well in court as he usually conveniently forget. 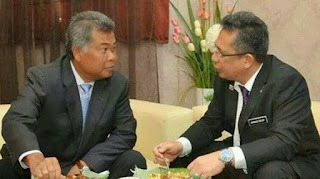 Deputy Home Minister, Dato Nurjazlan Tan Sri Mohamed felt Tun M and his motley crew of dramatic actors have no locus standi since they are not aggrived party. Tengku Razaleigh denied, thus indicating possible willingness to be played out again despite it is known Tun M is pushing for Dato Mukhriz as PM candidate against Najib. This is mere political wayang kulit (shadow play). Since it involves Geng Loceng, consider it a dramatic wayang Tamil. 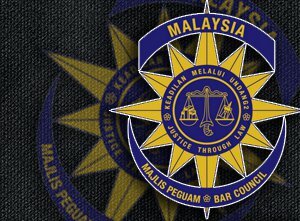 Critics are streaming endlessly at Bar Council for their intention to seek judicial review and to pass a motion to demand the resignation of Attorney General, Tan Sri Mohamed Apandi Ali. One statement from a DAP state assemblyman and lawyer, RSN Rayer caught many by surprise. He criticised Bar Council's action. 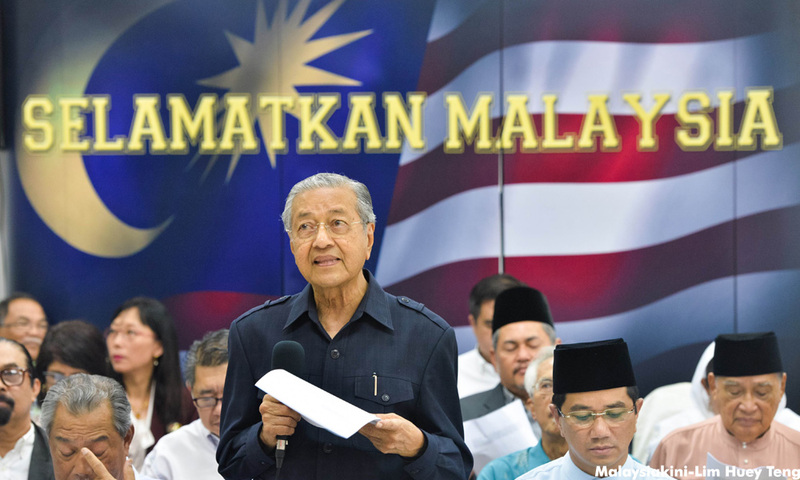 Tun Dr Mahathir gave a signal to start the call for a referendum to seek Dato Najib's resignation. 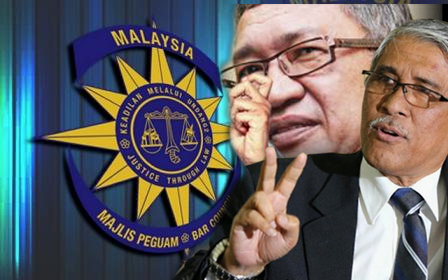 In reply through his blog, Dato Salleh Said Keruak criticised Tun M for playing ignorant. It is as though he does not know Government is not form from popular votes. DAP knows that there is only three ways to do so; via UMNO, or via vote of no confidence or via general election. Tun M lost out on the first two so is left with the third. But, it will smear his history legacy so the call for referendum. It is another attempt to hoodwink the public. It was in the same manner that Tun M gave an earlier signal to attack the Attorney General in anticipation submitted Investigation Paper by MACC will be thrown out. This was the theme in the wayang bulls and bulls by Tan Sri Abu Kassim, Tan Sri Gani Patail and Bar Council, said various inside sources. 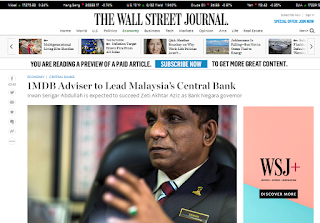 Wall Street Journal was trying to pre-empt Dato Najib's decision on the appointment for the Governor for Bank Negara Malaysia (BNM) with a spin. 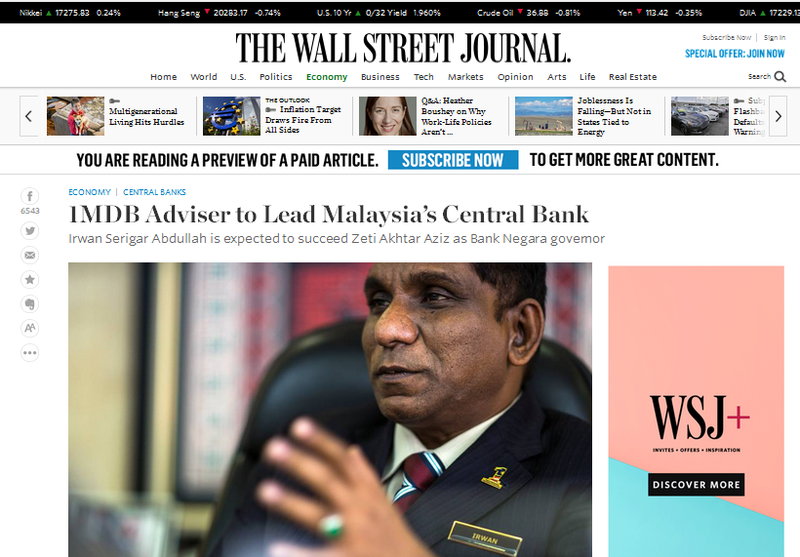 With the intention to maintain the newscycle, they reported Tan Sri Dr Irwan Serigar Abdullah as leading candidate and highlighted his position as member of the Board of Advisory of 1MDB. 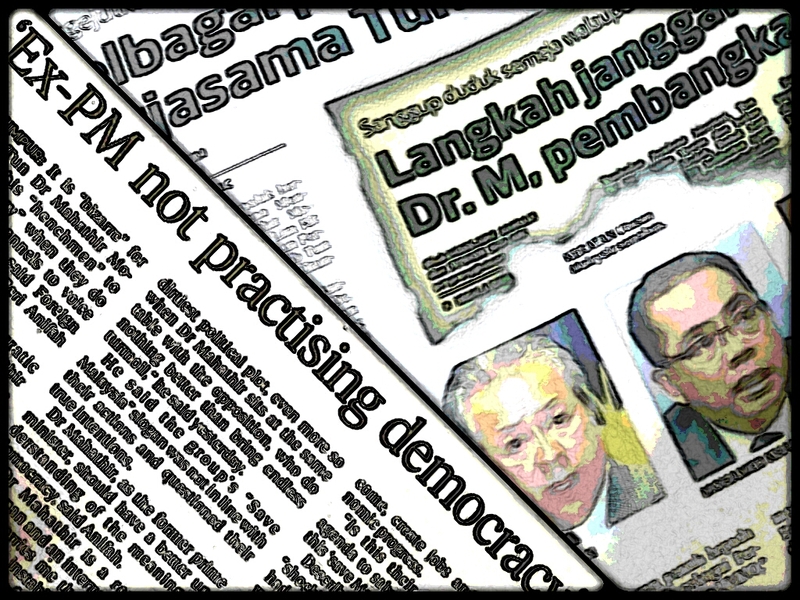 It is not uncommon practise for BNM Governorship to come from outside the organisation. In fact, Tan Sri Zeti Akhtar Aziz was the only first Governor that rose from the rank. Prior to Zeti, it was former Director General of EPU, Tan Sri Ali Abul Sulaiman. Appointing Irwan could mean a "demotion" from his current position as Secretary General of Treasury, in which BNM falls under MoF. 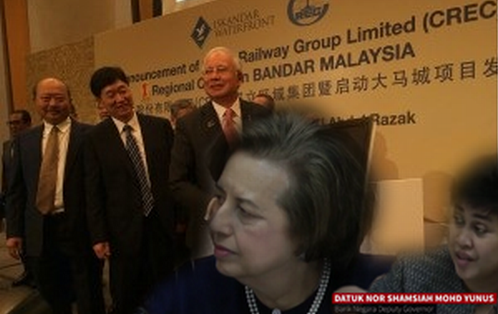 Zeti has been lobbying for an appointment from within using the excuse of no politicians. It seemed intended to stop a former BNM, turned politician and currently ambassador to the US from assuming the position. Odds is against an internal appointment in the light of suspicious involvement of certain top officials of BNM in a plot to frame and topple the Prime Minister. The Syariah High Court today ordered Datuk Seri Mahmud Abu Bekir Taib (pix), son of Sarawak governor Tan Sri Abdul Taib Mahmud, to pay a sum of RM30 million in muta'ah (conciliatory payment) claims to his ex-wife Shahnaz A. Majid. Syariah court judge Muhamad Abdul Karim Wahab, who read out the judgment in court said that while there is no fixed amount on how much should be paid, the claims awarded is based on relevant circumstances. He noted that this includes how much Mahmud could afford, the sacrifices and difficulty faced by Shahnaz during the past 10 years, as well as the status Shahnaz was after being divorced. Shahnaz had pledged to donate a third of divorce proceeding away. It is quite an honourable thing to do. It help to cleanse her tarnished name with some nasty revelation about her. Conversely, she was equally nasty on her ex. Go google it. This settlement expose something interesting about Sarawak Report or any other gossipy media. 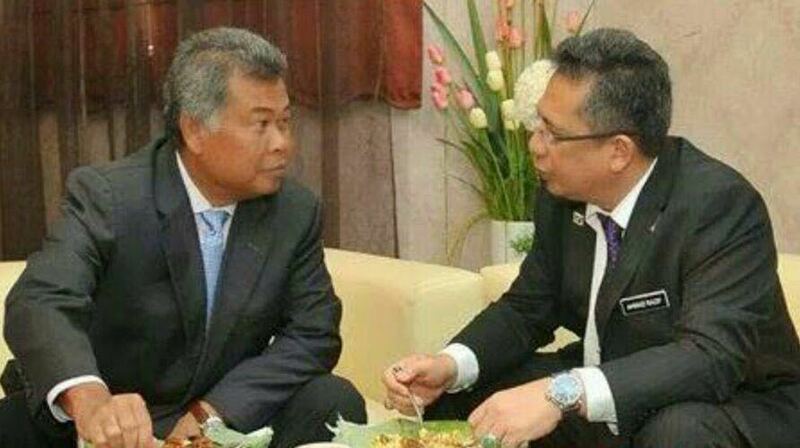 The former MB of Terengganu, Dato Ahmad Said made a surprise vote of no confidence motion at the Terengganu state assembly on Tuesday. It was not expected to get carried or passed. Speaker Dato Mohd Zubir Embong rejected the motion on basis of no notice given and some standing order issue. It could be considered a surprise since yours truly met him in his room at Hilton Sentral about 3 months before his removal by Sultan. When asked who he felt was the right successor to him, he mentioned current MB, Dato Ahmad Razif Abdul Rahman. 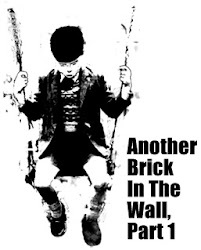 The latest move can only be expected of maverick Mat Said, as he is often called and his gedebe kampong style politics. Not sure how do they pronounced the Kelantanis term, gedebe in Terengganu. The nearest translation in English is macho. In his own way, he can be quite an endearing leader. In a past posting written in Ramadhan last year on June 17, 2005 [found here], 15 factual errors of Tun Dr Mahathir in his allegations on 1MDB was highlighted. When Good Star and Javace factual error are included, it adds up to 17 factual errors. Being the proud man he is, Tun M did not acknowledge his mistake but changed it to "bawah kelolaan Jho Loh" in the Citizens' Declaration. The factual error on the "RM42 billion lesap dari 1MDB" allegation was pointed but someone in Tun M's office said the facts does not matter, it is the principle that matters. Unless the yet to commence US$13 billion investigation by Swiss AOG is purely 1MDB and not involving other corporate clients of Jho Loh, including Middle Eastern companies, the accounts and transaction done by 1MDB shows Tun M was factually wrong. Principle must be fought on correct facts. That include the claim of Malaysia's corruption position in the Citizens' Declaration. Why didn't Daim appear in person to sign the Citizens' Declaration? This image viral in the social media. 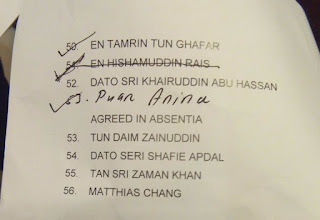 It shows the name of Hishamuddin Rais strucked out from the signatory to the Citizens' Declaration announced by Tun Dr Mahathir. Four names were mentioned as "agreed in absentia". Tun M's loyal former Political Secretary, Mathias Chang may have agreed though in absent. However, Tan Sri Zaman Khan has made statement denying that he agreed. Maybe he will not be caught dead signing something together with Lim Kit Siang. His fellow Kelantanis, Tengku Razaleigh Hamzah was expected to attend and sign but he did not, thus left Dato Ibrahim Ali stranded at the Cafe downstairs with Ku Li's conspiracy fabricators whose theories for decades have never materialised. Though Dato Shafie Apdal is in the list, one cannot assume he is agreeable. So the question, did Tun Daim agreed in absence? Media is giving endless coverage to Tun Dr Mahathir for leading the press conference of dissidents last Friday. Naturally, all comments from various personalities are competing for space. It can only be expected of pro-opposition media to blackout certain government officials. Nevertheless, Astro Awani's website reported the statement by Foreign Minister, Dato Anifah Aman [read here] but the posting cannot be found in their main page. The limited access was expected since Astro belongs to a close crony of Tun M, Ananda Krishnan. However, it is unthinkable for MSM to blackout or gave half-hearted coverage for Anifah. It seemed MSM could not fathom the significance of Anifah. He was one of the first leader who came forward strongly to defend Dato Najib in an early salvo by Tun M via an interview with New York Times in June 2015 last year. He wrote to NYT immediately when he read the news while in New York. [Read past posting here]. At least Singapore's media are cleverer to understand [read ST here and CNA here] the importance of Anifah to Najib's political fate. It is likely to gain attention of other foreign media. Someone influential and strong behind the local mainstream could be sulking from a cabinet discussion last Wednesday. Surely he is not dumb enough to think Sabah's voice and vote is not important to Najib, BN and the nation anymore. Tun Dr Mahathir's read the Deklarasi Rakyat at the gathering of DAP, PKR, PAN, dissident UMNO and leftist foreign funded NGO leaders yesterday. The declaration claimed concern for the economic, political and social situation of the country but the fact is the political upheaval and heavy endless policking in the country, in which Tun M used to admit himself, is the work of Dato Seri Anwar Ibrahim and the oppositions. The social problem in the country is due to agitation by the leftist liberal and foreign funded NGOs. All these only gained traction when Tun Dr Mahathir join in the fray started by DAP and PKR on lie, manipulate and spin the 1MDB issue. 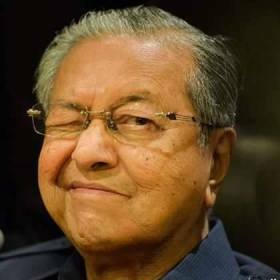 Still unable to proof his allegations, Tun M insist Dato Najib be removed. That was the crux of yesterday's demand which is quite typical of political power play. Surely, if yesterday's declaration was for rakyat, why is the bulk of the declaration from number 6 to 30 only talks of 1MDB? 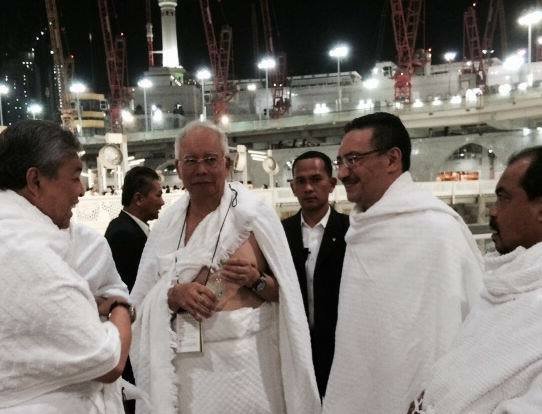 Is Hishamuddin distancing himself from Najib? Yes, Dato Hishamuddin Hussein Onn is together in the entourage with Prime Minister, Dato Najib Tun Abdul Razak to Saudi Arabia. But that is in his capacity as Defense Minister. Malaysia is in the Northern Thunder military exercise. Politically, Hishamuddin seemed to distance himself from Dato Najib in the same manner he distanced himself when Najib and his wife were under a barrage of slanderous attack on Altantunya-Perimeker affair towards the end of Tun Abdullah's premiership. He only started to throw the 'cousin brother' term around when Najib finally became Prime Minister. It was said he could hardly be seen at Sri Satria, official residence of the Deputy Prime Minister those days. Fine, the knife would be out if he is seen too cousin-cousin with Najib and not giving Pak Lah the respect then. But why is he is still distancing himself now that Najib is PM and in need of support?